Frank Puhlmann is heading the Product Management at Residential IoT Services GmbH, a company of the Bosch group. Prior to his current role, he was responsible for the Living IoT Lab at Bosch Software Innovations GmbH. He established and headed the IoT Partner & License department and the Methodology and Solution Architecture teams. Before joining Bosch, he worked as a Technical Product Manager and Head of Research at inubit AG (a Berlin-based BPM company) and as a Senior Research Assistant at the Hasso Plattner Institute in Potsdam (Germany). Frank's professional and research interests focus on the Internet of Things and Services (IoTS) and Business Process Management (BPM). He is especially interested in opening the field of IoT for traditional enterprises, ranging from IoT business model creation down to concrete software architectures. 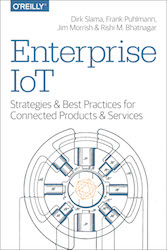 Frank is a co-author of Enterprise IoT, a book documenting strategies and best practices for connected products and services. As of today, he worked with major companies in innovative IT and IOT projects, including Adidas, Airbus, AOK, GE Digital, Ebay, Fiducia, Infosys, HanseMerkur, Salesforce, Tech Mahindra, and Tata Consultancy Services. The topics ranged from Business Process Management (BPM), Business Process Activity Monitoring (BAM), Industry 4.0, up to leading-edge IoT projects. In his spare time, Frank is working on open source projects (see github.com/frapu78) as well as developing mobile Apps like Magic Mimi, an app that works as a primer for pre-school kids and first-grades to learn writing spoken words. 1 Copyright Springer Verlag, Berlin. 2 Copyright Gesellschaft für Informatik (GI), Bonn. Read more on BPM spot.